Vanessa Bell, painter, decorator and designer of textiles & ceramics. Bell was born in London and she studied art under Arthur Cope in 1896 and at the Royal Academy Schools in 1901. After the death of her parents, Vanessa, her sister, the writer, Virginia Woolf, and their brothers, set up home together in Bloomsbury. The siblings entertained like minded artist & intellectuals and became known as The Bloomsbury Group. Vanessa married Clive Bell, a fellow artist in 1907. She worked in the Omega Workshops with Roger Fry and collaborated with Duncan Grant. Vanessa Bell eventually began living with Duncan Grant and they moved to Charleston, Sussex. It was in Charleston that she gave birth to their daughter. She exhibited at the New English Arts Club in the summer of 1909 and became a founder of Friday Club in 1910. Two years later in 1912, Bell participated in the Second Post-Impressionist Exhibition at the Grafton Galleries. She regularly showed in group shows at the Leicester Galleries, New English Arts Club (NEAC),Lefevre and Redfern Galleries, however her first solo show was at the Independent gallery in 1922. A memorial show was held at the Adams Gallery in 1961 and a touring show organised by the Arts Council in 1964. 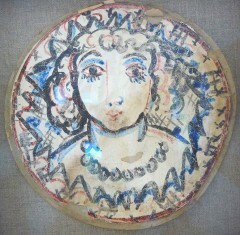 Vanessa Bell painted design for a plate.